An architectural announcement, exterior signage must be bold, instructive and true to the form and spirit of your vision. 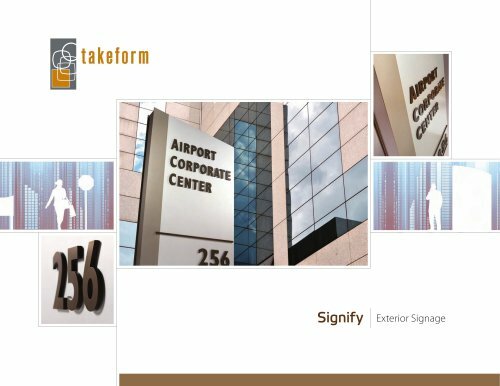 Like all Takeform sign systems, Signify expands your ability to deliver detail with elegant yet durable surface materials. Surprising shapes. Dimensional typography. Everything needed to convey brand, defy clutter and, of course, beautify. All in favor, Signify. Exterior signage is not the place to be timid. There’s too much competition. You must demand attention. But have the design choices to invite rather than scream. To be consistent with your architecture, and with your brand personality. Signify lets you conform — as loud as you want. Use your outside voice. Keep it current Since change is inevitable—your Signify sign can be updated at any time thanks to easily removable panels. What you don’t see—you will notice. • Non-corroding all aluminum framing. • Thicker face material to prevent “oil-canning.” • Concealed panel fasteners, out of sight but not out of reach. • Breakaway posts and panel signs with reusable foundation.